The Bassmasters of Gator Country team of Mark Blevins and Steven Thames wrecked them on Rodman with an impressive five bag limit that weighed 24.17 lbs. Their bag also included the big bass of the tournament that weighed 7.62 lbs. Steven said the team went out on the river Saturday and didn’t find anything so they opted to stay in Rodman for the tournament. As luck would have it, they found some bedding fish near the dam and managed to get their limit by 9:45 am. 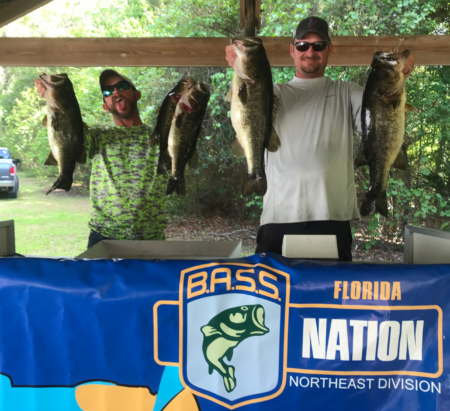 Coming in second to these guys was the team of Daniel Irish and Jerry Shawver of 1stCoast Christian Bass Club with 16.53 lbs. Third place went to the team of Michael and Greg Crumpton of Marion County Bassmasters with 14.32 lbs. Great job guys and thanks to everyone that came out and supported the FBN NE Region. The next event will April 14 on Lake Hernando.